When I got serious about growing our own food four years ago, I had no idea how much it would affect how my wife and I lived and managed our lives and our home. We had already made a conscious decision to shop, cook, and eat as locally and seasonally as possible. So, it made sense that one of the ways to accomplish this would be growing at least some of our own food, and to work on becoming urban homesteaders. The principles of urban homesteading, a term coined in 2001 by California urban farmer Jules Dervaes, are fairly straightforward, although they represent considerable challenges. The first principle is to grow your own food on your own city lot, with many urban homesteaders setting a goal to produce about 50 percent of what is eaten, frozen and canned. Although you can’t will spring to arrive sooner, you can turn on the oven. Not only does it warm up the kitchen without cranking the thermostat, it’s also the start of countless cold weather meals with nary a root vegetable in sight. The oven’s heat caramelizes the sugar in off-season cherry tomatoes (a guilty midwinter pleasure of mine), making them a worthy counterpart to creamy avocado and bitter, crunchy escarole. It adds appealing char to brassicas and concentrates the briny sweetness of olives and capers, and roasting is a foolproof way to cook rich Alaskan sablefish. If these recipes don’t cure your midwinter blues, roast a pineapple, eat it with toasted coconut and ice cream, and imagine you’re somewhere tropical. Community members work on what will be Philadelphia’s first Earthship. At a glance, the open-air lot at the corner of 41st and Lancaster appears to be littered with garbage—tires piled up in the northwest corner, mounds of dirt and cement mixed in with empty bottles and cans. But these familiar objects are not strewn about randomly; they have been intentionally collected to build the first urban Earthship. When it’s completed, it could be the most sustainable building in Philadelphia. When Lena Schaeffer turned 15 years old, her father asked her what she wanted for her birthday. Her answer: “A goat.” Her birthday wish was granted, and decades later, goats still hold a special place in her heart. Adorable though they may be, goats have become a serious business for Schaeffer and her family. The Schaeffers have been milking commercially since 1996 on their 47-acre farm in Bernville, Bucks County. In addition to their raw goat milk, the farm offers a variety of products, including yogurt, cheese and soap made from goat milk; pastured eggs and meats. They also raise chickens, pigs, Thanksgiving turkeys, Christmas geese and guinea fowl. 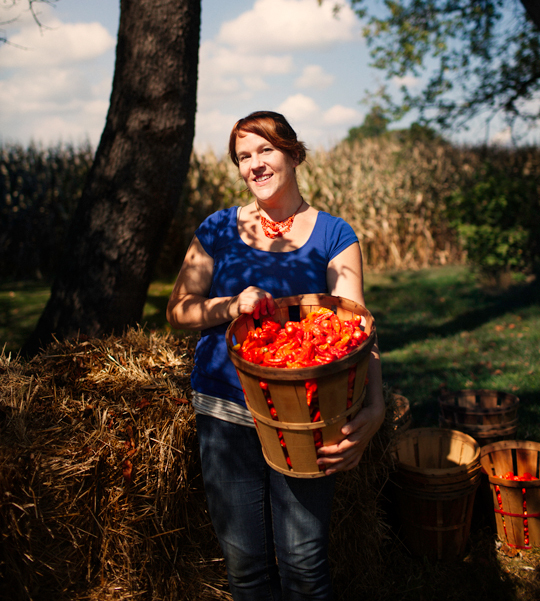 When Robyn Jasko launched her Kickstarter campaign in March 2013, her husband implored her not to be upset if her attempt to crowdfund a new hot sauce business was unsuccessful. By the time she woke up the next morning, her $850 goal had been met, and 45 days later, when the campaign came to an end, she had raised more than $53,000. Ask Tricia Borneman and Tom Murtha of Blooming Glen Farm how they met, and the couple credit a well-crafted mixtape. But almost 20 years since they first got their hands dirty together while urban farming as college students in Philadelphia, it’s clear that farming has been a strong thread running throughout their relationship. In the past 40 years, the number of women in the U.S. recognized as a farm’s principal operator—the person running the show—has more than doubled. This is progress. Though the numbers have grown, women still make up just under 14 percent of the overall number, and continue to face issues most male farmers do not. There can be expectations within the family about managing childcare, or the struggles of working with equipment designed for men. And then there are the hard-to-pin-down disadvantages that result from being part of a minority that may not be taken seriously by some. To address this, the Pennsylvania Women’s Agricultural Network (PA-WAgN) was formed by a group of women farmers and Penn State researchers in 2005, working to support, educate and empower the women who wish to farm. Most job interviews are nerve-wracking, anxiety-causing ordeals. But at the very least, they don’t take very long. But that’s not the case if you are applying for an internship at Ledamete Grass Farm in Lehigh Valley. Farmer and co-owner Rob Fix adjusted his hiring process to include a two-day working interview after he and his first intern mutually decided to part ways in August 2013—several months short of the season's end, after Thanksgiving.